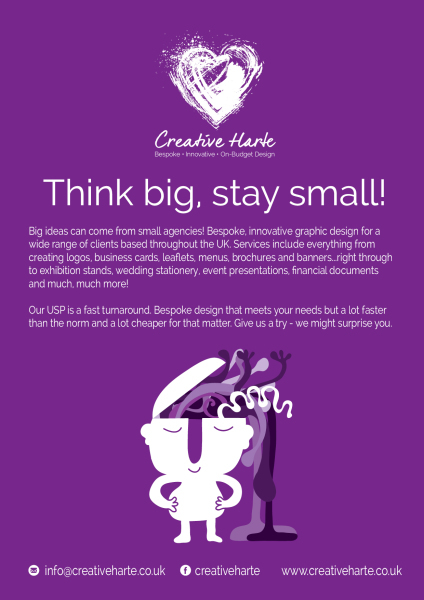 Creative Harte is a graphic design agency based in Colchester, Essex. Creating bespoke, innovative graphic design for a wide range of clients based throughout the UK. Founded by Laura Harte (hence the amazing name) the business has grown each year from a box hut in the back garden to a wee office, that is now home to Laura and her mini team. Services include everything from creating bespoke wedding stationery, wedding decor design, logos, business cards, leaflets, menus, brochures and banners...right through to exhibition stands, event presentations, financial documents and much, much much more! Our USP is a fast turnaround. Bespoke design that meets your needs but a lot lot faster than the norm and a lot cheaper for that matter. Give us a try - we might surprise you. Warner Bros, Mercedes Benz, Wimpy, Di Maggio's Restaurant Group, Sports Bar and Grill, Netball Scotland, Traceall Global, Silks Lingerie, Glasgow Council, Diabetes Scotland, Suio Water, Scottish Thistles, RSPB Renfrewshire, Thomas Cook, to name but a few.